This is hard. This business of watching someone die. Really, really HARD. But as with all things that are hard, it has had its joys, as well. Right now I suppose I can’t think of any, but I am sure they are there. My dad went quickly, just over two months ago. We barely said good-bye. Now it’s mom’s turn, and the good-byes seem endless. It’s a paradox, really. You want it to be over, but you never want it to be over, for that means your beloved mom is gone. But I promised myself I would walk my mom Home, and, along with my brother and sister and my husband, that is what I’m doing. Sitting for days watching the natural progression of death, or THE PROCESS as we have come to know and hate the phrase, causes a person to evaluate life at its most basic level. What will my children be saying to me and about me when faced with this same scenario? Actually, that was the easy part. And possibly the joyous part, as well. Aside from some silly quirks that we loved to tease her about, my mom was darn near perfect. I’m not kidding. This woman, born on a farm in the midst of a great flu epidemic, was tough as nails. A self-described tomboy, she grew up in a family of 5 girls and 3 boys. Her dad nicknamed her “Johnny.” Always joyful, smiling, and full of life, she had great stories, and what a storyteller she was! And yet, she was an enigma. By the time I came along she was 40 and had lived nearly half her life. She was polished, educated, and well versed in her parenting and pastoring skills. She always said I was a compliant child, so I guess that didn’t hurt, but she had this way about her that just made me want to please her. Spanking wasn’t necessary – it was THE LOOK that made me want to do the right thing, and never disappoint this amazing Woman of God. I wouldn’t be truthful if I said I actually accomplished that….. But that’s another story. Yes, I was the youngest daughter of a lady preacher. It made for an interesting life, to say the least. She was a tell-it-like it is, no-nonsense person who continually believed in her children and their greatness. Some of the most important lessons and biblical truths I learned were from watching my mom. There was the time a man came to the door, asking for a handout. We lived in the house next to the church, and everyone knew it. I stood back as I watched her tell the man to sit on the front step while she went to the kitchen and made a sandwich. Bringing it to him with a drink, she shared Jesus’ love in a tangible way and he was grateful. When I asked her why she didn’t give the man a couple of bucks and send him on his way, she told me the Bible says that we could be entertaining angels, unaware, and proceeded to tell me a story from her childhood during the great depression. One of her most vivid memories of God’s provision was when her family sat down to eat at a table with no food. After saying grace, there was a knock. The man at the door said he was from a new bakery in town and they were delivering bread samples to the local families. That night, the large family gave thanks for a generous businessman. Upon asking around the next day, though, they could find no one who knew of this bakery. It didn’t exist. So, the family story has always been that an angel brought the loaves of bread that night. For the rest of her life, she never wavered in her belief that God would always provide what they needed. And He always did. Being the daughter of a lady preacher in the 60’s and 70’s gave me a sense that I was part of the Women’s Movement long before it became the mainstream. I could do anything. There was no boundary that would hold me back from what I wanted to do because my mom had blasted through the ultimate glass ceiling. She was a woman doing the work of a Man of God. And she did it well. Her sermons were compelling, her counseling wise and her prophesies accurate. At home she was just “mom” to us and “Mrs. J” to my brother’s buddies, but to the rest of the world she was a force to be reckoned with. The authority with which mom prayed and preached was not lost on me, even as a young girl. Without saying a word, she taught me about spiritual warfare and the dire consequences of taking it lightly. It seemed that the enemy was constantly on the attack, and she handled each one with a firm grace that defied what must have been going on inside of her. I knew, without her ever telling me, that if her bedroom door was closed, she was in prayer. And not the sit on the edge of your bed God Bless Yous, either. She was in the fervent, groaning in the spirit kind of prayer that turns God’s ear a little bit closer. Her favorite saying was, “But God!” When things looked hopeless and bleak, she would say, “But God!” When she would write in her journal about the destruction in the church brought by people with jealous spirits, she would write, “But God!” When she was discouraged about family members she had prayed for without an answer, she would say, “But God!” Her faith and confidence never wavered. Ever. So I guess walking my mom Home really started when we began our walk through life together. I have gleaned 50 years of experience and knowledge from her. Some I have used already, most I suppose I have yet to draw from. But now, in these final moments of her life they come crashing through my brain like a flash flood. It is almost overwhelming, the legacy she leaves me. I only hope I can do the same for my own children. From Tami: It seems there is no end to the words I am constantly putting together in my head. I “write” all day long – life is a running narration for me; that’s just how my brain works, I guess. Unfortunately I seldom actually put it down on paper or electronic media. During the long weekend that we were in waiting for my mom’s imminent death, I read a book, mindlessly flipped through magazines and glanced at photo albums. Finally, I pulled out the laptop and started typing. My mom took her last breath 7 minutes after I hit the “save” button. I thought it was time to share this with you. I’ve always heard it – at funerals, mostly. Death is precious. Go figure. Babies are precious…but death? Not so much. It’s so hard for us mortals to even comprehend — how could God count as precious that which causes the rest of us such pain? And yet, it reminds me of the time I asked my mom if it bothered her that so many of her friends were dying at this stage in her life. Her face literally lit up and she exclaimed, “Oh, no! That’s our HOPE!” My perspective on death was instantly changed that day. As the days of mom’s life grew dimmer and she had her sights fixed on heaven, it became clear to me that the death of a saint is not only precious in the sight of the Lord, it is precious to the saint as well. Do you struggle with the preciousness of death? It’s funny how memories come flooding in when you least expect it. Sometimes they are sweet, evoking a tender smile or even laughter in response. Sometimes they are bittersweet, with a grimace or twinge of regret coming along for the ride. And sometimes, those memories are just so vibrant and real that you’d swear your loved one was about to step into the room and join in the fun. That happened to me today. Most unexpectedly. I was completely taken by surprise. No forethought of avoiding sweet Easter memories of mom and dad’s church days went into the decision to visit my niece and nephew’s church in Glendora and enjoy Easter worship with the whole family. It never occurred to me that Easter would be anything other than the big, busy worshipthenhavefamilydinnertogether day it has always been. No matter that usually my birthday is celebrated along with that day, or that mom and dad have shared every Easter with us since the beginning of time. Nosirree, there were no misgivings about the day at all. In the six months since daddy went to heaven so quickly and unexpectedly, I have barely had time to reminisce about his contributions on this earth. But one thing I will always, always remember fondly is the way he led the congregation in singing. 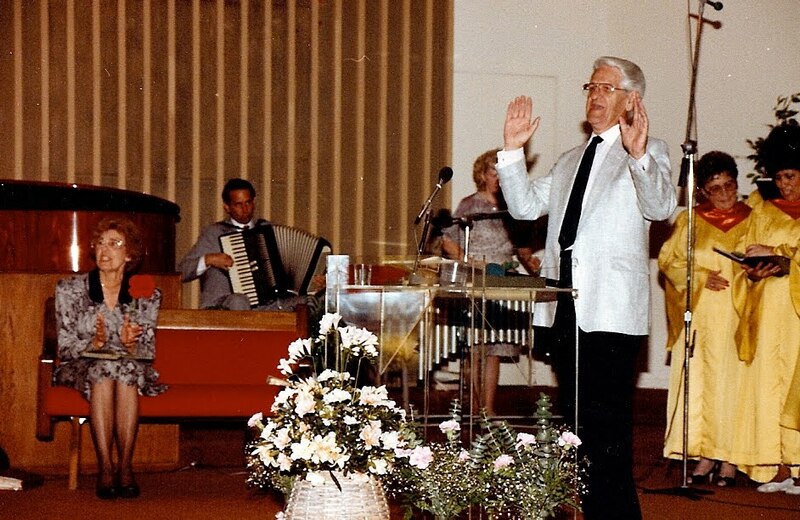 Normally a bit of a wallflower, when my dad was behind the pulpit leading worship – he was a force to be reckoned with! There was no one like him… I find it almost impossible to describe. 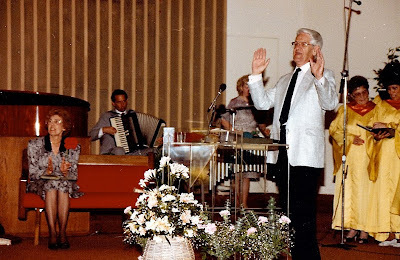 He would begin a song with the normal old-school arm waving to the time of the music, then progress to engaging everyone in the room with his enthusiasm and genuine love for the hymns and choruses, old or new. I don’t know if the tears flowed because of the overwhelming sweet memories and missing my daddy at that moment, or if I was just so grateful to Jesus for rising from that grave and rescuing us from our lost lives, or maybe a combination of both — but there was now no point to having spent 15 minutes on makeup that morning. No going back now; and besides, as the very next song began, “Christ the Lord is risen today…..” (late 1700’s, Charles Wesley, by the way) another flood of memories swept over me. Those two songs set the tone for me, and gave me a chance to remember some very sweet moments about my dad. Though not a musician, his love for music was contagious. From my earliest memories I suppose his love of the hymns instilled in me a sense of excitement for worship; of anticipation that this is the place where God dwells ~ this is what He longs to hear from us. This is God’s party. And He wants us to revel in it until we join Him in the ultimate celebration in Glory. Party on, dad!